Judith Compton’s passion and years of experience in the fashion industry led her to create a line of meaningful, beautiful, and inspiring jewelry items. Her brand, Mala and Mantra, is a fusion of classic meditation beads and modern style– all gorgeously and thoughtfully put together by a talented group of women working in a fair trade collective. When Jamie Bullock brought this brand to my attention, I had to learn more about it! Here, Judith shares her story with us. How did M+M begin? Was there a lightbulb moment for your vision of the company? I consider myself a chronic ‘soulpreneur’ and was soul searching for what I wanted my next creative venture to be. I knew it would be something that would help sustain artisans, specifically women artisans if possible, as I am an advocate of fair trade and women empowerment in underprivileged communities abroad, as well as in our own backyard. I had been purchasing products for our stores and clients for over a decade and supporting artisans both locally and globally. I knew if I created a product that could be widely distributed, I could create jobs and provide livelihood to those in need. Since I was a very young girl I have had an obsession with beads, specifically gemstone beads, and through my meditation practice, I had started a nice collection of mala beads. The lightbulb moment came when I was meditating and practicing yoga in my morning ritual and happened to pick up a 108 bead mala to help me focus on a mantra with the goal to become focused and help me search within. That’s when the universe answered me. 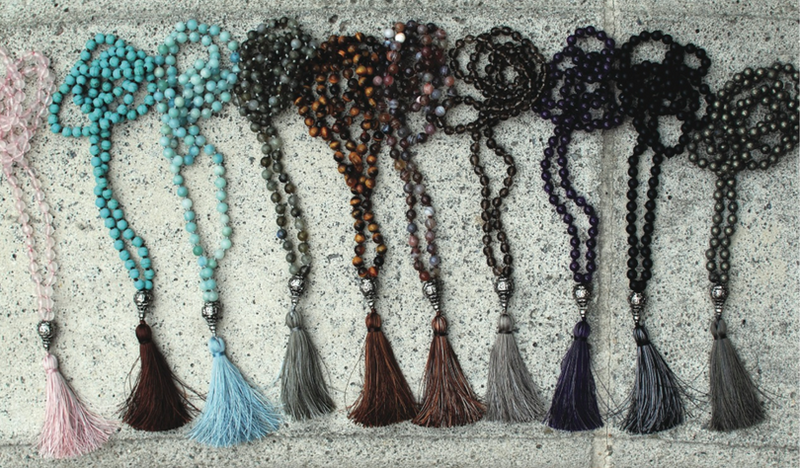 What made you choose the name “Mala and Mantra”? The word mala is Sanskrit for “garland” and it represents the traditional authentic 108 bead mala which is to be used in meditation—some refer to them as prayer beads. They are similar to a rosary; however, instead of praying on each bead, the meditator chants a mantra on each of the 108 beads. The word mantra is also Sanskrit and means “chant, sound, or syllable.” I noticed that you cannot properly use a mala without a mantra in meditation, and since the mala beads were my inspiration, I wanted to stay true to their intended purpose and create authentic mala beads that can be used in meditation. What does “fair trade” mean, and how have you established a company with fair trade principles? Fair trade is defined as a social movement with the goal to help people in developing countries achieve better trading and create sustainability. Fair trade, to me, is about creating fair sustainable fashion that helps elevate the artisans and the communities they touch through old fashioned hard work and skill. It is also about providing a safe working environment and fairly paying artisans for the value of their time, skill, and craftsmanship. Fair trade inspires me to create products that highlight the traditions and resources of a particular region where the artisans are from, showcasing the craftsmanship that has been handed down for generations and the natural beauty of a land and its people. At M+M we have established a company that is all about creating long term sustainable incomes for our women artisans around the globe. 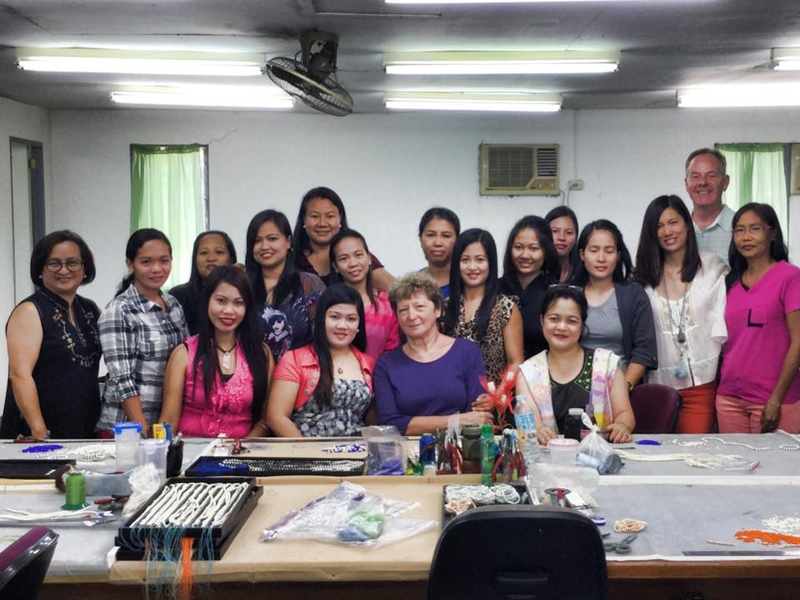 Working with our fair trade women’s cooperative in the Philippines is the passion part of the equation for me, as I have always wanted to do something to give back to the Philippines, where my parents immigrated from over 50 years ago. By working with Filipino women artisans, I feel a unique connection based on a shared heritage which motivates me to provide them with a long-term livelihood program. I am also very excited to start working with women artisans in Mexico to develop our new line of accessories. The long term goal is to partner with fair trade organizations around the globe to create more fair sustainable fashion. What was one of the most challenging aspects of getting your brand started, and how did you work through it? Coming up with the entire concept—I was all over the board, I drove my husband and friends crazy with so many different ideas and I was not focused initially. Through many brainstorming sessions with talented friends and lots of long solo meditation sessions, I came up with the concept to create mala beads and mindful accessories that would help to spread the message behind the meditation beads—mindfulness and wellness. I was fortunate my experience of 20 years in the hospitality retail business had provided me with contacts and friends in this world who believed in me and took a chance by testing the product. How did you find the co-op in the Philippines? When my husband Charles and I went to the Philippines on a business and personal trip in 2009, we attended a trade show where our cooperative happened to have a booth. We stayed in touch through the years and saw them when we returned to the Philippines two years later. I was not ready in 2009 to start a new brand but always had them in the back of my mind as I recalled the quality of their craftsmanship. Fortunately by staying in touch, I was able to reach out to them when I was finally ready to develop the line. 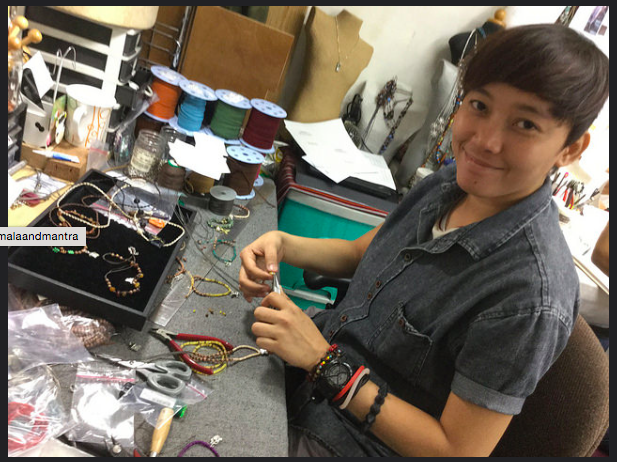 Can you tell us a little about the women who work at the fair trade cooperative in the Philippines and craft your mala collections? They are all lovely, and they are all Filipino which I am as well (100%). I felt a sister type bond with many of them. When I met them earlier this year, it was a very special day. Although most of them don’t speak much English because they speak a dialect, we were still able to connect in a uniquely Filipino way. Fortunately we had a translator so I was able to have conversations with them via the translator. They range in age from 19-47 years old. There are two sets of mother and daughter artisans which I think is wonderful and a testament to how the cooperative has been able to sustain two generations. There are some women in their thirties who have been co-op members for over 14 years. Some are shy and quiet, and others are more outgoing and funny. They were all very personable and warm, which in my opinion is part of the Filipino nature that I feel blessed to have been brought up in. In what ways have you seen the lives of these women impacted by their work with Mala + Mantra? I actually interviewed each woman artisan when I was there in February. I specifically asked each one how the work they do for Mala and Mantra impacts her life. I was amazed at the variety of answers I received; some of them are using the income to support their families, specifically older family members, which is part of the tradition in the Philippines. Some of the younger ones told me how they use the money to pay for their college education. Other women told me how it helped them feed their families and put their children in school. Listening to them tell me how the work we provide helps them made me feel so grateful that I am able to do what I do and impact these women’s lives and the lives they touch in their homes and communities. You use a diverse range of beautiful gemstones to create your products, how do you choose these stones and how are they responsibly sourced? When I design a new collection I start with a concept and a color palette and research the gemstones that will work with my vision. Once I determine which stones I would like to use, I work together with the cooperative director and we source the best quality gemstones in Hong Kong. I went to the largest gem and jewelry show in Hong Kong this year and spent 3 days finding the best quality stones from the most dependable and responsible suppliers that our cooperative has had relationships with for years. What is your philosophy towards giving back to the communities that support your business, and in what ways do you achieve that? We started our new ‘Crafted for a Cause’ Collection as a vehicle in which to give back and support communities and causes close to our heart. Our first collection ‘I am Cabo’ was designed to assist in raising funds to provide relief for those affected by the devastation of Hurricane Odile in Los Cabos, Mexico last September. We have many causes close to our heart at M+M, one of which is breast cancer awareness. We are getting ready to launch an ‘I am Hope’ collection to assist in giving back to organizations that support those going through cancer, as well as aid in the search for a cure. Why are you focused on providing fair trade work to women, specifically? Because women can change the world! Women are task-oriented, motivated, caregivers, and cheerleaders. If we can empower women in underprivileged communities, they make sure the children and family are fed, they make sure children receive education, and they take care of themselves, their families, and their communities. We feel if we can empower women through fair sustainable work, they can elevate themselves and their families out of poverty. If you could give one piece of advice to other women who are pursuing an entrepreneurial dream like this, what would it be? Take the leap of faith, stop thinking about it, stop doubting yourself, and start doing! Face the fear and trust your truth! A very big thank you goes out to Judith for sharing her story, and to Sisu Creative and Jamie Bullock, for connecting us and helping to bring awareness to her brand. To learn more about the brand and shop the collection, visit the Mala and Mantra website.